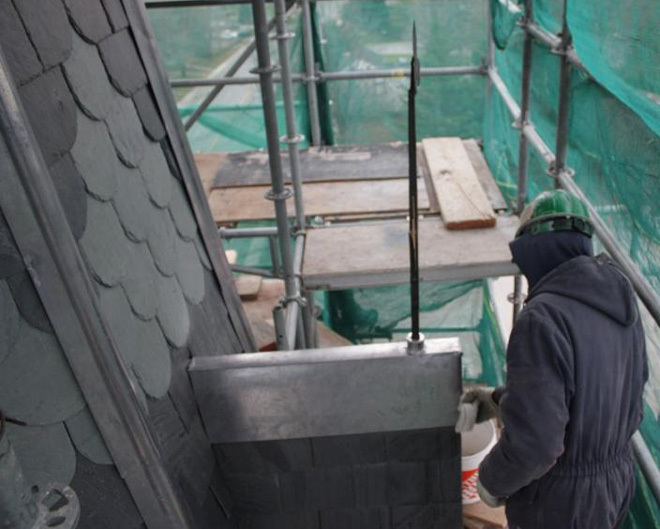 Copper gable ridge cap, note trefoil finial mounts. 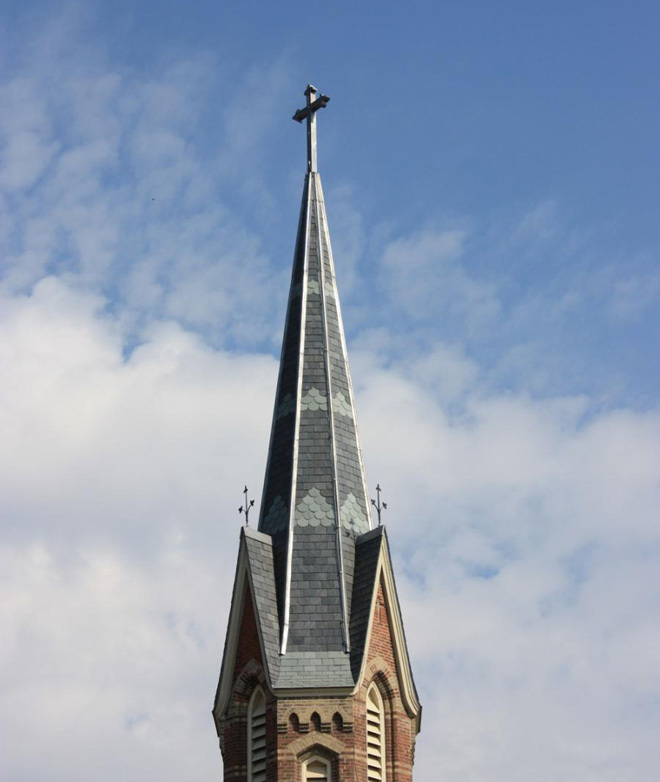 Charles A. Murray & Co. Limited, of Everett, Ontario replaced the roofing slate and flashings on St. Francis Church in Ajax, Ontario. Roofing slate at this extreme pitch will last a long time, about 120 years, in this case. The sheet metal flashings had failed sometime previous and been amended. Charles A. Murray & Co. replicated the two color pattern using a black slate in the field with bands of Vermont unfading green, in the “beaver tail” style. They fabricated and installed all flashings in 20 oz. lead coated copper, including custom round ridge cap, ornamental lead coated copper top flashing and a lead coated copper church cross. The finished result is very handsome, very original and very durable – – scheduled to last another century, plus. List of Sheet Metal Roofers. Detail hip cap and “beavertail” cut band in Vermont unfading Green. Full elevation of work area, note trefoil finials on gables. 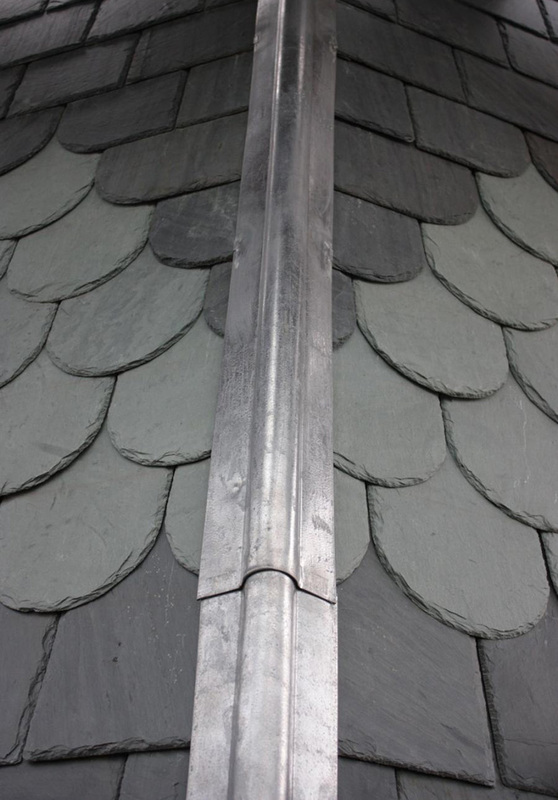 This entry was posted in Roof Restoration and tagged Church Restoration, Ontario, Roofing Slate and Tile. Bookmark the permalink.